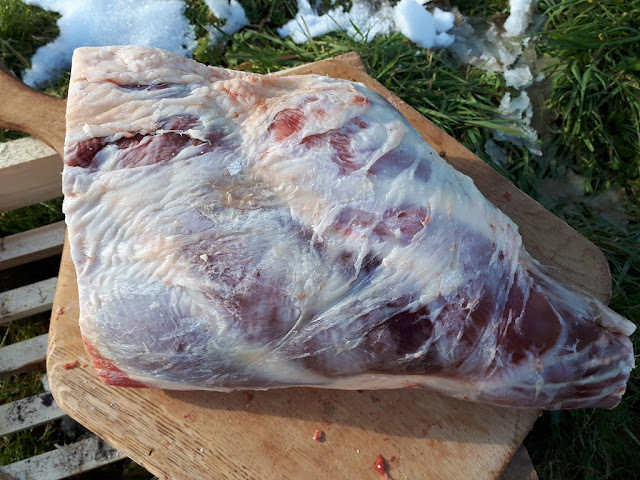 An English Homestead: How Many Meals Are In A Whole Lamb? 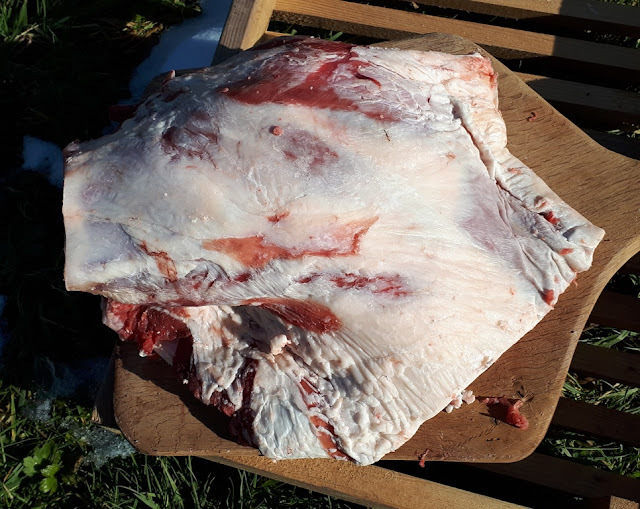 I got asked on Facebook how many meals are in a lamb? A tricky question to answer as everyone eats a different amount and it also depends on how you butcher it. 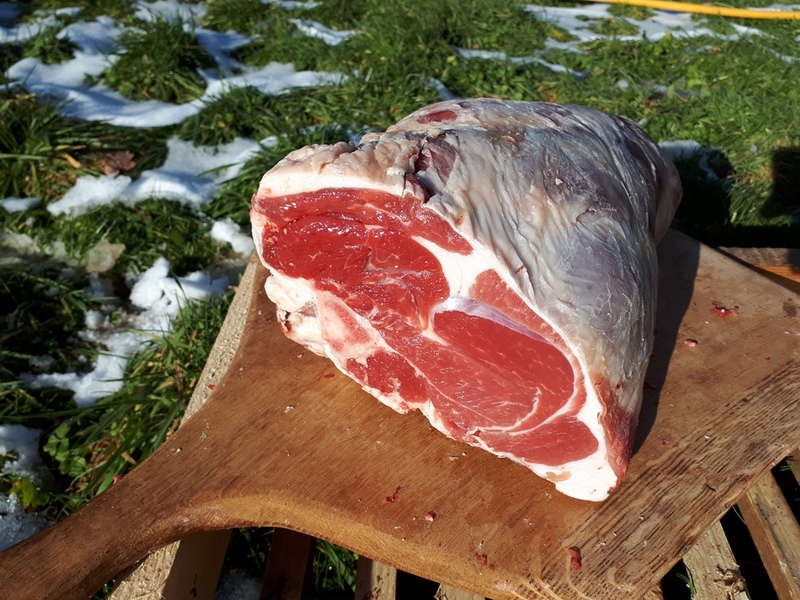 I just butchered a whole lamb this afternoon while my little boy slept. I'm only an amateur so please be kind as to my cuts! Two legs of lamb. I've kept these whole but sometimes I will split them to make a leg and a chump joint. I'd say this would easily feed 8 people with probably some leftovers. Chump steaks. There are 6 of these at a good size. These would be a rump steak off a beef animal. 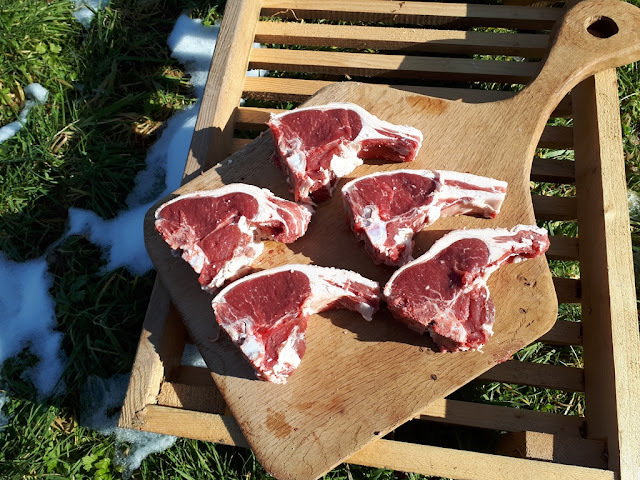 Lamb chops. I love leaving them long like this for cooking on the BBQ. There are 7 on each side so 14 in total. I'd want a few per meal though! 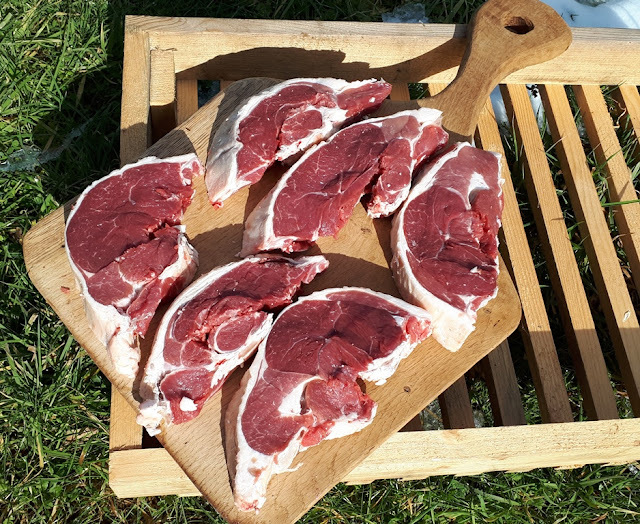 Loin chops. These are always lovely. I'd want a couple of these per meal. When I butcher I get 10 per animal. 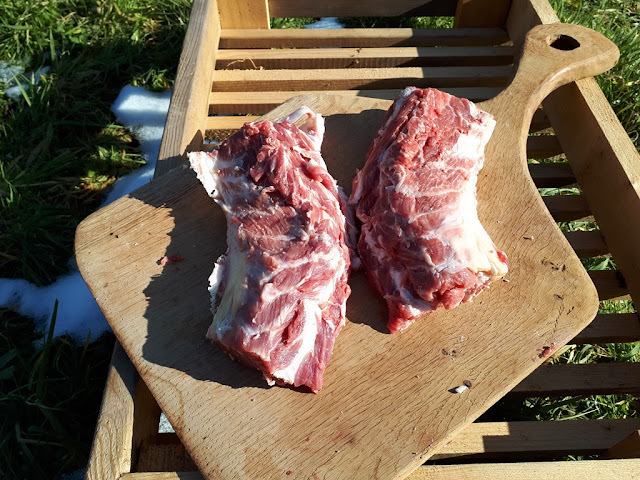 Lamb neck fillet. There's two of these per animal and they benefit from long slow cooking, there's a surprising amount of meat from them. Lamb shank. I'd need both of these at least! And they need cooking low and slow. Shoulder. I'd normally split this in two to make smaller roasting joints. I have de boned them in the past as well to make them easier to carve. Breast of lamb. The joint I love to hate. I'm going to trim out the fat and mince these as I much prefer burgers to breast! They do cook nice when you stuff them and cook them slowly. The bones! Far from a waste produce they make lots of brilliant stock and add goodness and flavour to lots of meals. I'll be making more stock this week. So I'd guess at around 50 adult servings plus from a whole lamb maybe more depending on how you use your leftovers or less if you eat a lot of meat. Also the stock can be put to great use and make scotch broth. 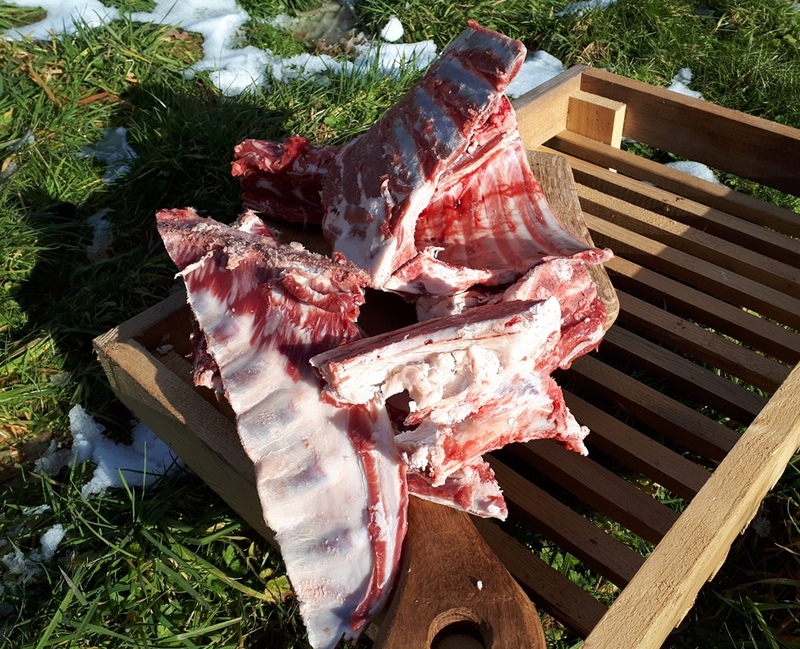 You also have the offal so kidneys, liver, heat and lungs to use up and, depending how far you go with it, things like the intestines and stomach to make things like haggis and sausages. There's also loads of ways to butcher an animal like this, with many more different cuts for different purposes. 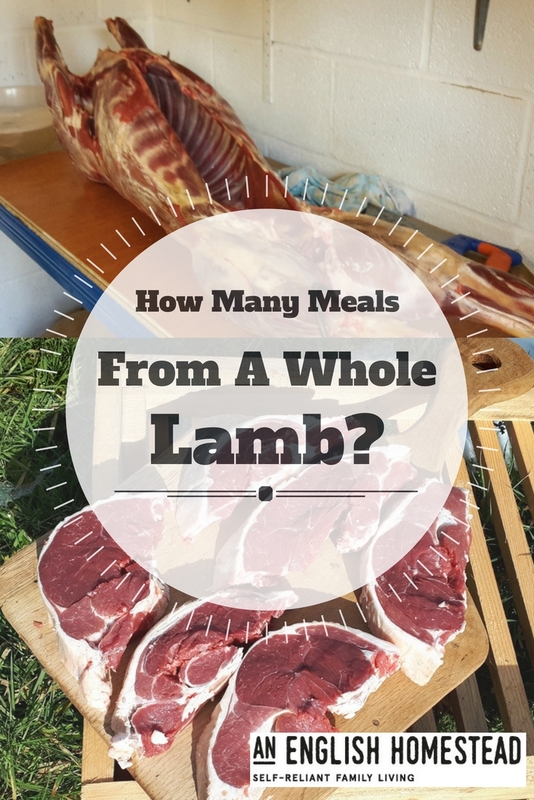 How many meals do you think is in a whole lamb? What's your favourite cut of lamb? 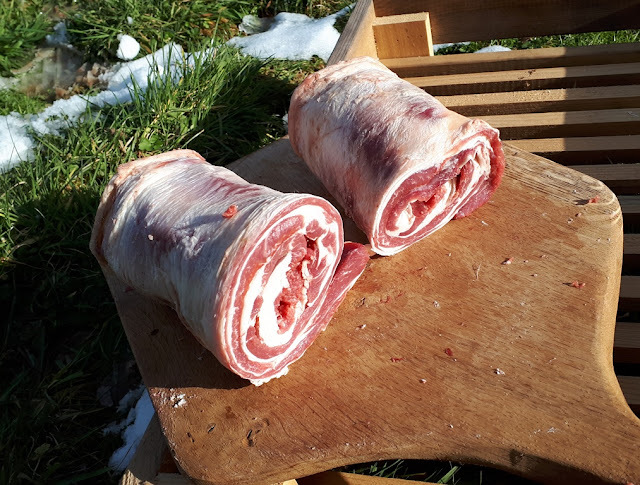 Breast of lamb rolled and stuffed makes a great meal, slow cooked so some of the fat cooks off. Sliced on BBQ is great as well. I have done it rolled and stuffed, I just prefer to trim it heavily and mince it to make burgers! great for BBQs! How interesting - thank you. My step-sister and her hubby raise two types of lambs but I've never thought to ask! No worries! Thanks for commenting! I butcher my own too. I like to leave the joints large as we are often 10 for sunday tea and a smaller joint than a whole leg or shoulder wouldn't go round. If I were to serve chops there would be few left, so I tend to keep chops for when there is just the two of us. So I guess my answer would be that it depends on the size of your family! Do you home slaughter as well Gill? 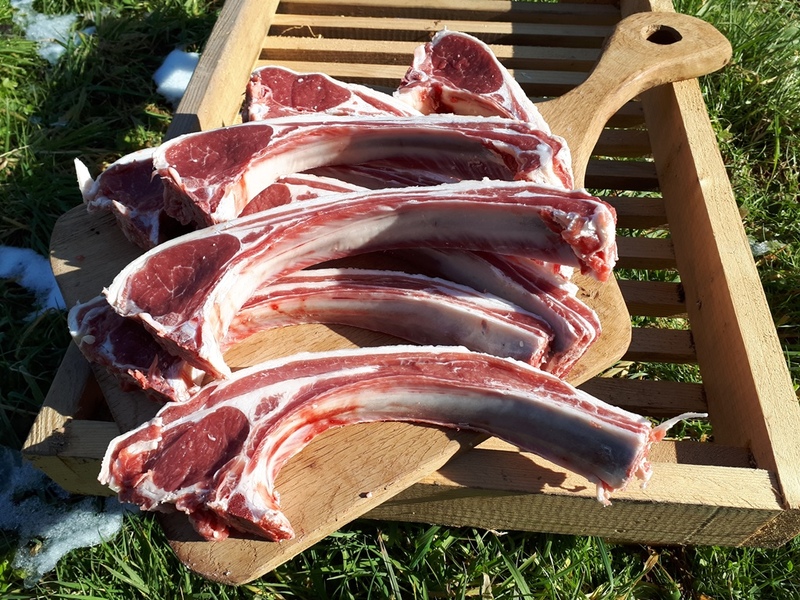 I save the chops for BBQs as they're great if left long. I'm leaving the legs whole as hopefully be great when we've got people round. All those cuts look really good, but those steaks are calling my name. Well done you. I love the chump steaks! We eat a lot for just two of us so don't get as many as most would. I just made two necks (marinated, slow roasted and delicious) for dinner night before last and hubby had the rest for lunch today. Pretty tasty though. We had neck last night as well, two slow cooked for 8 hours. Cooked down lovely and tender. 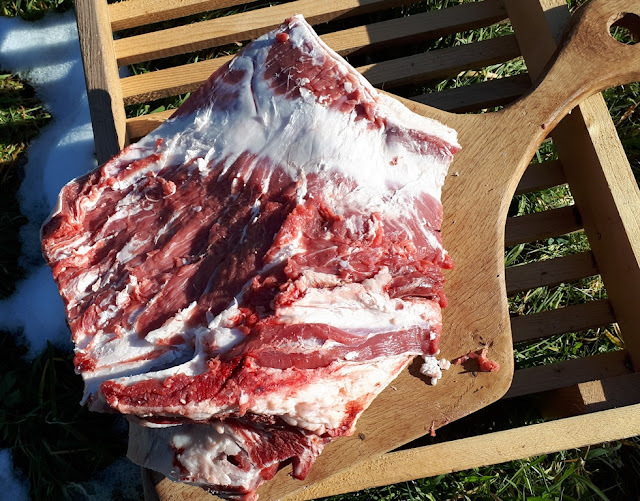 A great job of butchering, your cuts are similar to what we get from the goats, we make our joints small as we just have the two of us to feed. I keep them big as we like to entertain, but I have chopped up a few of the shoulders for burgers and for lamb curry. 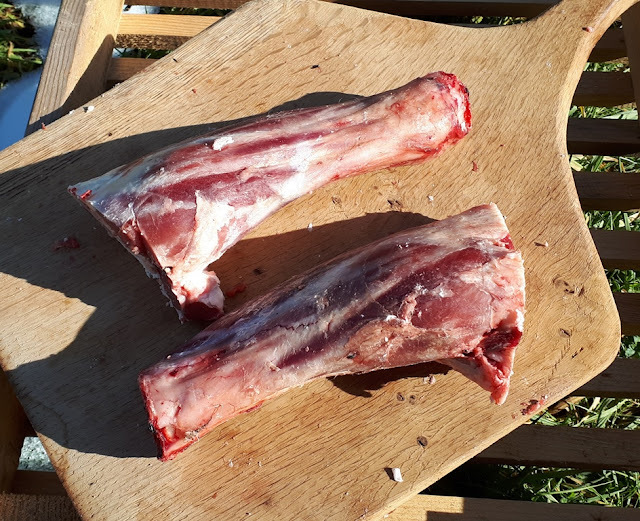 When we were buying whole lambs my favorite cut were the shanks. Jamie Oliver has a beautiful recipe for a lamb shank pie with puff pastry crust. The shanks all stick out of the crust and it's stupid easy but really impressive if you have people over. He doesn't do bad recipes! Every one is a winner! Lamb shank pie sounds good but I cut hem quite short to keep the meat on the joint. I've got a fair few saved up now so slow cooked with a mint gravy.